Home > Bacteria in Everyday Life > What is Toxic Shock Syndrome? Toxic shock syndrome (TSS) is a severe illness that comes on very suddenly as a result of an infection with either Staphylococcus aureus or Streptococcus pyogenes. The bacterial growth does not, in itself, cause the problem. These bacteria produce toxins that get into the blood stream from their site of growth, causing widespread problems in the body. One of the first symptoms is a sudden increase in body temperature to about 102 degrees Fahrenheit. The affected person feels very weak and light-headed and may faint because their blood pressure also drops quite quickly. Nausea, vomiting and a watery diarrhoea also begin. After a few hours, someone with toxic shock becomes very confused and anxious, and a bright red rash that looks a lot like sunburn starts to appear. The kidneys and liver can be affected and the condition is extremely serious as it can bring on multi-organ failure within a short time. How do People Get TSS? 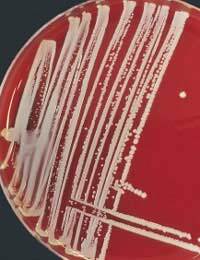 True TSS, as caused by Staphylococcus aureus was first recognised in the 1980s. There was a huge increase in cases, particularly in the USA, and the link was first made between TSS and tampon use in menstruating women. At the end of the 1970s, companies started to make tampons that had very high absorbencies and that were designed to be worn for days, to cover the entire menstrual period. This seriously backfired because a tampon left in the body for prolonged periods of time became the ideal breeding ground for Staphylococcus aureus. The bacterium flourished with the supply of menstrual blood and the aerobic environment that the tampon provided. Toxins released by the bacteria entered the woman's body and then the bloodstream, causing the symptoms of full blown toxic shock. About 900 women were affected in one year, and 40 died. Understandably, the super absorbency tampons were withdrawn from the market and other high absorbency tampons were phased out. Women were encouraged to use low absorbency tampons and change them frequently throughout their menstrual period, or to switch to sanitary pads. The incidence of toxic shock syndrome due to tampons is now much lower, but it can still occur in young girls as they first start their periods. Their inexperience in using tampons can lead to situations where the tampon is left inside the body by mistake. Rarely, TSS also occurs due to an infection on a cap or diaphragm, an internal contraceptive device. Streptococcal TSS, caused by Streptococcus pyogenes is rarely caused by tampon use. It develops after skin infection, in a cut or surgical wound. The symptoms are the same. It is important to get anyone showing signs of toxic shock syndrome to hospital as quickly as possible. The source of the infection needs to be dealt with – removed in the case of a forgotten tampon – but treated with antibiotics in all cases. Because the syndrome develops very rapidly and can be fatal in cases of multi-organ failure, fluid replacement therapy, steroids and intravenous antibiotics, with close monitoring can be required. People who are at risk of multi-organ failure are usually put into intensive care as a precaution. TSS is a relatively rare condition and now that the problem with tampons has been recognised, the risk of it developing with normal tampon use has decreased. However, it makes sense for women to change tampons frequently and to never leave a tampon in at the end of a period and then forget about it. As the bacteria that cause toxic shock syndrome can grow in the tampon before use, it is better to store them in a cool rather than a warm place. The bacteria can also survive on the hands and could infect others through contact with skin wounds. It is therefore important for menstruating women using tampons to wash their hands very carefully after removing or inserting them. Skin wounds and cuts should be treated promptly, with antiseptic cleansing of the area and then using a plaster or bandage to prevent bacterial contamination. With these simple precautions, TSS will become even rarer.